This is a story of a family of six that became a family of four overnight when the mother and oldest son die in a car accident when the youngest daughter was six years old. 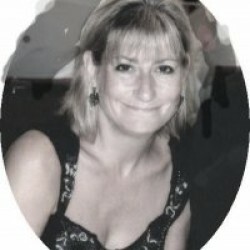 It's present day and Elizabeth, the youngest daughter is now 38 years old. Elizabeth was in the back seat of that vehicle then and was not killed. Her and the remaining other two siblings are visiting their elderly dad. It's the first time they have been all together for a number of years. The siblings LOVE to bicker. They are constantly aggravating each other and the oldest daughter (a lawyer who is doing very well) is forever telling everyone how they should run their lives. There are humorous moments, sad moments and very sad moments. A family memoir in which a Fannie Farmer cookbook is a big deal for the family as the mother used it to write a lot of personal notes which the family cherished. 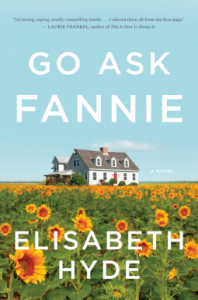 When the family asked what was for dinner, the mother would always reply "Go ask Fannie" hence the title of the book. I found this to be a very entertaining book and thoroughly enjoyed reading it. While the kids did bicker a lot, it wasn't enough to get on my nerves and at times was sort of humorous.